Efficient and advanced conventional vent water heater. *For complete information, consult written warranty. 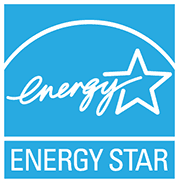 ENERGY STAR qualified Energy Efficient Gas water heaters are more efficient than conventional gas water heaters thanks to the automatic flue damper and electronic gas valve. The damper opens prior to pilot ignition, under control of the intelligent micro-processor built into the electronic gas valve. After the damper opens and the pilot sequence is complete, the burner ignites and exhaust gases travel up the internal flue tube and out of the water heater. The powered damper closes once the heater satisfies, eliminating air flow through the flue tube to reduce heat loss and optimize efficiency. The damper and electronics are powered by a low voltage 24 volt transformer that gets its power through a 10 foot conventional power cord that plugs into a household 110/120VAC outlet.